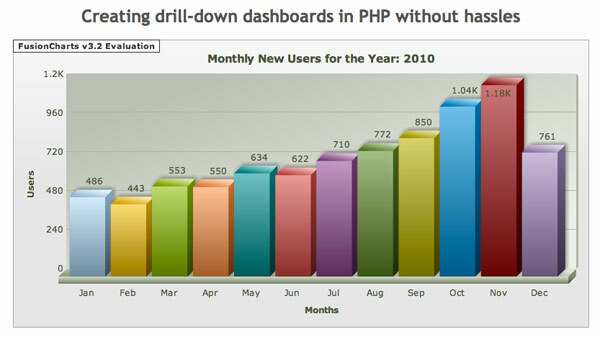 New from NetTuts.com today there's a tutorial showing you how to use the FusionCharts tool to create interactive drill-down dashboards with a few simple PHP scripts. Presenting data in a graphical format always helps a lot in parsing the data efficiently. If the charts are interactive and linked, that’s even better. Drill-down charts allow you to convert individual data plots (columns in column chart, pie slices in pie chart etc) of a chart into hotspots (or links). These items, when clicked, can open new charts and you can navigate between these charts easily. They use the LinkedCharts feature of FusionCharts to make the graphs clickable. They set up a basic database-driven system that holds some randomly generated data for display. Full PHP and HTML are provided to create a simple chart like this where you can click into any of the bars for more detailed information. You can also download the full source or check out a demo. On the Ask About PHP blog today there's a new tutorial about integrating the OpenFlashCharts tool into a CodeIgniter application to display data. He walks you through the steps needed to install - putting all of the files in the right places, creating a controller to use the scripts and a view to output the finished chart. A demo of the end result is also included.